Eastin Hotel Petaling Jaya Malay Cuisine junior sous chef, Mohamad Hamedy Yaacob, is a chef with 16 years of experience. Specialising in Asian food, mainly Malay cuisine, he has experience in Indonesian and Thai fare. 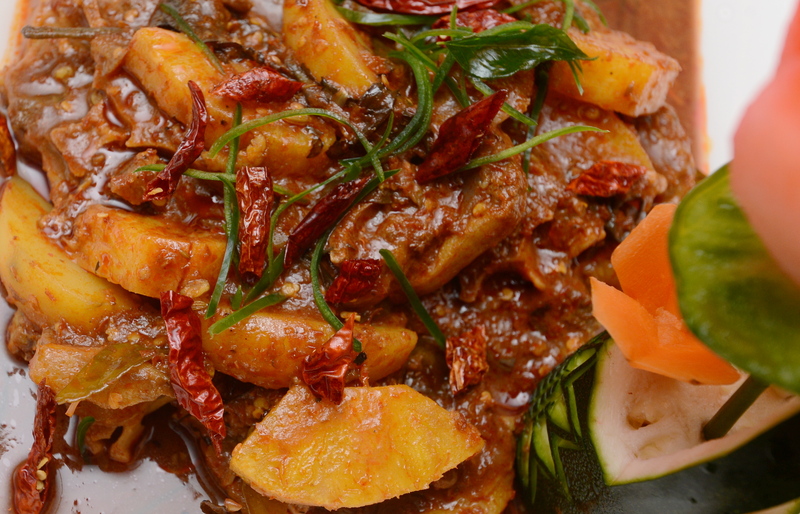 This Malaccan dish, which is usually associated with fish or stingray, has been given a little twist as chef Hamedy substitutes seafood for the rich flavourful oxtail. The slightly tangy assam complements the oxtail by balancing out the savoury taste of the oxtail, while the oxtail lends weight to the gravy, giving it a stew like texture. Preparing the oxtail Boil oxtail in water for 30 minutes. Sauce Heat up some oil in a medium-sized pot. Put in the blended base ingredients with the fried shrimp paste and dried shrimps; stir-fry until aromatic. Then add fenugreek mix, followed by tomato paste and lightly stir-fry. Add the water used to boil the oxtail / oxtail stock with one tablespoon of the assam jawa water. Lastly, add the potato wedges, followed by the sliced pineapple, kesum leaves, ginger flower stem, lime leaves and salt to taste.